3D printed guns and firearms have once again become a hot-button issue within the 3D printing industry, as the world’s first 3D printed revolver has just come to light while the New South Wales government has implemented a law that specifically makes owning a 3D printed gun illegal. Yet even if firearms aren’t your cup of tea, if you either design or create 3D printed products, you could be infringing on IP law, copyrights, or a host of other legal issues without even knowing it. As a topic that easily generates a lot more questions than answers, we could probably all use a little brushing up on the legal aspects surrounding 3D printing. Luckily, Dutch law firm De Clercq Advocaten Notarissen has just issued a brief yet educational white paper that covers everything from intellectual property law (IP) to copyright law, to the especially murky waters of product liability, all within the new reality of the 3D printing industrial revolution. Though written based on Dutch law and regulations, these are generally implemented based on the European Directives, and thus will be consistent with many other European countries, and in some cases perhaps not so far off from US or other nations’ policies. While some companies are succeeding at producing high-quality molds, tooling, and manufacturing aids with 3D printers, others are still scrambling to figure out how best to incorporate the new technology into their systems. That’s according to this infographic recently published by PTC. The majority of companies now have access to 3D printers, but not all of them are confident they are making the most of them. That’s not surprising. Often the machines aren’t seamlessly integrated into the product development cycle. And to make matters worse, the journey from CAD design to printed artifact can require data to pass through multiple steps and often multiple applications before reliably building on the 3D printer tray. Despite the uncertainty with this new technology, most agree that 3D printing is already transforming the way we manufacture products. That’s because it’s an approach that can offer more design freedom, faster time to market, lighter weight options for parts, waste reduction, and, best of all, cost reductions. And the good news is that we’re quickly overcoming barriers to efficient design for additive manufacturing. Technology is beginning to connect printers directly to CAD systems, and as a result it’s becoming easier to find and correct problems in the digital design before they become problems in the physical product. 3D printing increases efficiency and reduces waste, making it a valuable tool in efforts to make manufacturing more sustainable. Its applications range from medical devices to aerospace — and possibly even drinking water. Earlier this month General Electric announced a project with the Department of Energy that uses 3D printed turbines in a process that could make desalinated seawater 20 percent less costly to produce. The environmental and economic benefits of 3D printing have the potential to transform traditional manufacturing through cost reductions, energy saving and reduced CO2 emissions, according to a paper published last month in the journal Energy Policy. 3D printing can potentially reduce manufacturing costs by $170 billion to $593 billion, energy use by 2.54–9.30 exajoules (EJ) and CO2 emissions by 130.5 to 525.5 metric tons by 2025, the paper says. The range within the savings is due to the immature state of the technology and the associated uncertainties of predicting market developments. Author Supercharg3dPosted on 24th November 2015 30th March 2017 Categories Supply Chain ImpactTags SustainabilityLeave a comment on Is 3D printing the future of sustainable manufacturing? 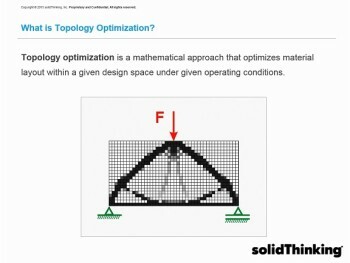 Why marry 3D Printing with Topology Optimization? 3D printing gives engineers the freedom to design products that cannot be manufactured any other way. The process of adding material, as opposed to subtracting material, allows for more intricate shapes. This has given engineers an unprecedented chance to design lighter, more organic looking products. Historically, the way we make objects has influenced the way we design them. “When we use a traditional CAD to design a part, the CAD is based on Boolean operations or subtractive design,” said Jaideep Bangal, senior application engineer at solidThinking.